Casual Kitchen: That Man Moved the Sanka! That Man Moved the Sanka! "Advertisers have frequently harnessed the respect accorded to doctors in our culture by hiring actors to play the roles of doctors speaking on behalf of the product. 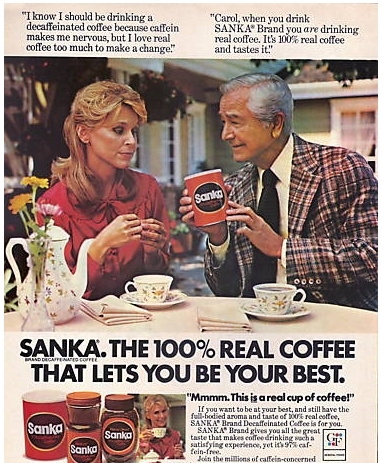 My favorite example is a TV commercial featuring actor Robert Young counseling people against the dangers of caffeine and recommending caffeine-free Sanka Brand coffee. The commercial was highly successful, selling so much coffee that it was played for years in several versions. But why should this commercial prove so effective? Why on earth would we take Robert Young's word for the health consequences of decaffeinated coffee? Because—as the advertising agency that hired him knew perfectly well—he is associated in the minds of the American public with Marcus Welby, M.D., the role he played in an earlier long-running television series. Objectively it doesn't make sense to be swayed by the comments of a man we know to be just an actor who used to play a doctor. But, as a practical matter, that man moved the Sanka." If you're even only vaguely interested your own consumer empowerment, Cialdini's book is a must-read. And while many readers today may not recognize the name "Marcus Welby," there are plenty of examples across today's advertising firmament that copy the Marcus Welby model. We all know the common advertising template of using a celebrity character from television or the movies to peddle product. It's just that today, in our post-media era, it's done in a more sophisticated or ironic way. But the effect is the same: it gets us to buy. But the funny thing about these types of celebrity endorsements is this: Yes, sure, they work--but once you think about why they work... well, all of a sudden they stop working so well. "From the first time I saw it, the most intriguing feature for me in the Robert Young Sanka commercial was its ability to use the influence of the authority principle without ever providing a real authority. The appearance of authority was enough. This tells us something important about unthinking reactions to authority figures... we are often as vulnerable to the symbols of authority as to the substance." It wasn't just that this guy wasn't a doctor. He was an actor who played a doctor, who was using his "doctor-ness" to promote a product. On some level it's hilarious to think that this could work at all to sell product. And yet it did. Sanka sales--remember, sales of a product that didn't even taste any good--exploded upwards thanks to these ads. "Okay, okay," you're thinking, “but that was the seventies. People were gullible dumb-asses back then. Today when we hear 'I'm not a doctor but I play one on TV' we laugh. We instantly hear satire. We're way too sophisticated to fall for this silly and transparent marketing trick." Except we still do fall for it. It happens when Wilford Brimley, spokesman for the diabeetus, uses his trustworthy, old-country persona to promote Liberty Medical. Uh, and Quaker Oats. It happens when TD Ameritrade uses actor Sam Waterston (or more accurately, Waterston's earnest persona as Assistent DA Jack McCoy from Law and Order) to sell discount brokerage services. And yes, it even happens when two generations of Spocks ironically sell us Audis. It's the same trick. They're still using it on us. And it still works. Repeat after me: in the food industry and in the consumer products industry, advertising and marketing expenses are the single greatest source of costs, and they are always imputed in the final price of the products you buy. All branding and advertising costs are always passed through to the consumer. If you buy any heavily-advertised product or service, recognize the role you are playing in the advertising-consumption cycle. You pay for those ads. Including the ones using phony symbols of authority to trick you into buying. See advertising for what it really is: a destroyer of consumer value. Don't buy. Juli, thanks for sharing an excellent, object example of the technique. That's just a great, great example of exactly what I'm talking about. Thanks for this. I discuss advertising in the college courses I teach, and I'm excited to have another text to refer to. Also, "the diabeetus" -- yes. Not to be confused with diabesity, of course.